Ravensworth Wines is a small winery in the cool climate, high country, Canberra District of New South Wales, Australia. 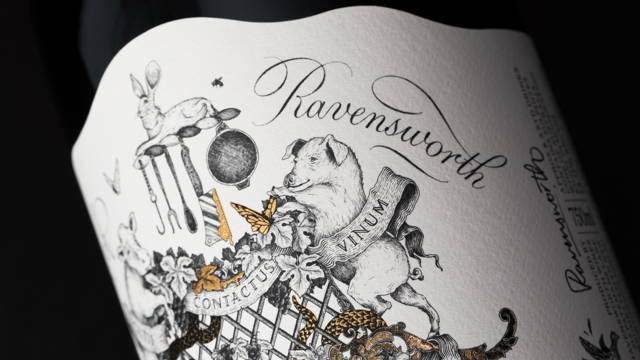 The Estate Ravensworth illustration is a slightly grotesque representation of the traditional coat of arms you can find on bottles of wine. In this parody there is cooking tools, pig head, insects, all of them nice, quirky and morbid in the same time. The composition is reinforced by the addition of a gold foil, bringing light, warmth, and elegance. Elements from the current label realized by Steven Noble, such as the cleaver and various cooking implements needed to be included in the new illustration as a way to link the two ranges and reinforce the branding. Concept and art direction by Cloudy Co.
Art direction - Claudia Passera / CloudyCo.